There is nothing worse than a Clogged Drain in San Tan Valley, AZ. It has a way of completely putting your life on hold. There are many things to try to unclog an already clogged drain and ways to prevent your drain from becoming clogged again. Before reaching for any kind of chemical, grab a plunger. Plungers pose no danger to pipes. They are the best method for unclogging a drain when they work. Put on rubber gloves and feel for the drain. Place plunger completely over drain hole and give several gentle pumps to allow the plunger to grip. Give several firm pumps. If the clog has not released try again. If after several attempts this is unsuccessful try the next method. Chemical unclogging is sometimes necessary if the clog is very tough. Before grabbing commercial drain cleaners try a couple home methods first. Grab some baking soda and vinegar. Put the baking soda down the drain then slowly pour the vinegar down the drain. Cover the drain with a plug and let the mixture work. After 30 minutes unplug the drain hole and pour boiling water down the drain. This should release the clog if not try the next method. Go to your local hardware store and purchase an acid based drain cleaner. Before attempting to use these, put on safety glasses and gloves. Be sure to open windows and doors so the area is well ventilated. Slowly pour the chemical down into the Clogged Drain in San Tan Valley, AZ. Allow the acid to work. After about 30 minutes run hot water down the drain. If none of the above methods work, call a professional to fix your Clogged Drain in San Tan Valley, AZ. 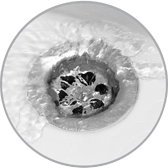 Putting too many things down the drain can ruin your pipes and be very costly. You can attempt to unclog your own drain. If all attempts have failed consult a professional. You can prevent drain clogs by using a screen over your drain and by squirting dish soap into the drain twice a month.